We received your application regarding a job placement here at the LangHam Hotel. After going through your CV/RESUME, the Hotel Management have considered hiring you for your service. Attached herewith is an Interview Form containing some questions which the management would like you to answer. As soon as we receive your response to our questions we will furnish you with more details as regards your job application. I want to also inform you that the Hotel Management will fully support you as regards the procurement of visa and all other supporting documents that would be required for you to proceed to the United Kingdom. For more information please do not hesitate to send me an E-mail on langhamhotellondon@gmail.com or call +44 704 570 1346. We have received your response to our questions sent to you in our previous email addressed to you. The management of the LangHam Hotel found your answers satisfactory. You have shown us that you are competent and capable of delivery quality service here at the LangHam Hotel. The management of LangHam Hotel will like to use this medium to inform you that you have been accepted and offered a job placement here at the LangHam Hotel. We are acknowledging you as our latest worker. The management believe that you carry out your duties industriously. This is an Affirmation that your experiences and qualifications were found suitably qualified for the requirements of LangHam Hotel, London.This document attached embodies the Agreement Letter of the job that is been offered to you. You are expected to sign and send back scanned copy to us if you agree with the terms and conditions. Note that you are to bear some of your travel documents processing expenses upfront to prove your seriousness and commitment to work with our reputable organization. You are to bear the cost for obtaining your Foreign Affairs certification and Work Permit/Resident Permit. While the hotel management will bear the cost of processing your Visa and flight ticket. When your travel documents are ready, we shall proceed with the securing of your accommodation here in London at the company's Staff Quarters. We must have confirmed your visa, your seriousness and willingness to join our team here in London. You have to write a letter via email to AJS Travel & Tours LTD, our Immigration Consultant here in the United Kingdom for the processing of your Immigration Documents such as Work/Resident Permits Documents, Foreign Affairs Certification and other supporting Immigration documents before your job commencement period. 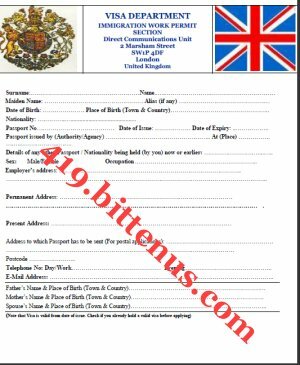 You will also have to forward scanned copy of your signed Agreement/Contract Letter to them for confirmation that the LangHam Hotel, London employed you, so as to enable them proceed further with the processing of your Immigration Documents. The contact details of the AJS Travel & Tours LTD are given below. The reason for this personal processing of Immigration Documents by employee, is due to the fact that in the past after processing the documents for some employee they don't show up for job duty, where by incurring cost for the company. We therefore advice you to carry on every due processing with our immigration consultant for the procurement of your Immigration Document. Your employer LangHam Hotel, London has asked us to contact you on requisite information required to process supporting documents that would aid your travel down to your duty location to resume duties in record time. However included herewith are details and information regarding procurement of your travel documents and other supporting documents. The LangHam Hotel has mandated us to procure as well as process your relevant travel documents, immigration particulars and other supporting documents to facilitate your travel to United Kingdom for commencement of work in due time. With respect to the requirements and certifications and other supporting documents to be acquired, we wish to inform you of the Department of Expatriate Resources (DER) requirements which states that all expatriates who intend to work in United Kingdom must have attained all DER Certifications in various categories with respect to their contract engagements. Vaccination would be carried out at the port of entry into the country and it is advisable to present all documents on procurement as that would enable the authorities vested with the duty to carry out the vaccinations; administer their duties. The DER Certifications will have to embrace the registration and approval of your relevant information with the designated local agencies (Federal Ministry of Foreign Affairs, Commerce and industry respectively with DER inclusive). As a result of time constraint for expatriates owing to the work commencement date, we ensure that you forward the information needed for the procurements of your required documents and thereafter we shall inform you on prompt. All completed Documents should be expected within 3-5 working days and required receipt of payment for work permit form registration. Note that processing of requisite documents takes 3-5 working days, and as soon it has been completed, we shall furnish to the British High Commission in your country as regard to update of schedule of your meeting with the British High Commission in your country for formal verification. NOTE: If there is any part of this information that you do not understand perfectly, please do contact us immediately via email or contact your employer, The LangHam Hotel and we will get back to you immediately with all the necessary information required.